Youth for United World (a global organization organization that stemmed from the Focolare Movement in Italy in 1943) with its 7,000 members is an inspiring premonition of how the future generation will be the guardians of our planet. GenFest 2018 focused on various activities and causes that, as the saying goes, “brings back our faith in humanity.” For starters, the organization is known as one that espouses consciousness among its members – mindful of the impact of their actions on the community, their families, and the environment. Coca-Cola Philippines, in line with its thrust of empowering the youth, supported the organization. “The youth of today are the future stewards of the planet, and it is a great opportunity to be partnering with them in sharing our vision of a more sustainable world. We hope that through partnerships like these, Coca-Cola becomes an ally of the youth as we contribute in finding better solutions to the various concerns of the communities and the environment,” said Samantha Sanchez, Coca-Cola Philippines Public Affairs and Communications manager. More than supporting the event, associates of Coca-Cola Philippines also joined the youth organization for a clean-up drive in a nature reserve off the coast of Manila Bay – one of the last few habitats for migratory birds and resident herons and kingfishers. The islands that dot the Cavite-Laguna Expressway are some of the few wildlife reserves in Metro Manila. Collectively known as the Las Piñas-Paranaque Critical Habitat and Ecotourism Area (LPPCHEA), the islands that were originally part of a planned reclamation in the area have become a wildlife sanctuary that is home to a mangrove forest for both resident and migratory birds. 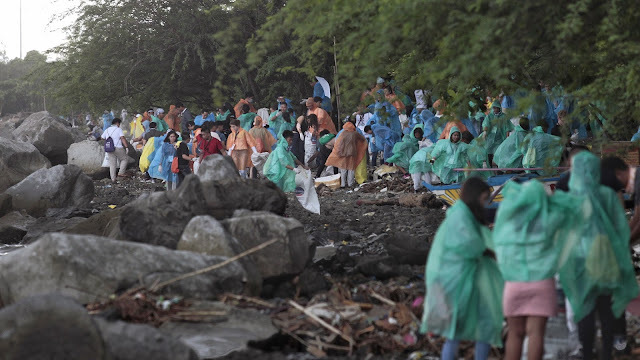 However, beneath the lush greenery of the islands and its thriving avifauna is a tragic story – the island also serves as a shorefront for various plastic waste that float in Manila Bay, the Paranaque River, and the Estero de Tripa de Gallina – bodies of water that have become channels for waste. “In line with our global goal to work towards a World Without Waste, we are supporting various organizations that can help us turn this dream into a reality. No matter how small the act may be, it’s one positive action that can create ripples as we continue to strive and find ways to solve the global problem on waste,” said Sanchez. Together with GenFest 2018, over 2,000 youth and associates of Coca-Cola Philippines picked up various kinds of trash, most of which are post-consumption waste and single-use plastic. The Bukas Palad Foundation, one of the clean-up drive partners, along with the rest of the GenFest committee, reported that 278 sacks of single-use plastic, laminates and Styrofoam, 180 sacks of recyclable plastic bottles, 205 sacks of rubber, and 22 sacks of glass were collected despite the onslaught of the southwestern monsoon, or habagat. Early this year, The Coca-Cola Company announced its goal of a World Without Waste in the midst of the growing consciousness of the global problem on waste. The goal seeks the retrieval of every bottle that the beverage brand produces. Acknowledging its role in the problem, the Company is working with various non-profit organizations, local communities, and government agencies in finding ways to breathe a second life into the post-consumption waste created by their products. Coca-Cola Philippines will continue to work with the youth in its bid to achieve the goal of a World Without Waste. Coca-Cola associates join in cleaning the coasts of the Las Piñas-Parañaque Critical Habitat and Ecotourism Area (LPPCHEA). Coca-Cola associates collect sacks of single-use plastic and other discarded items like bags and shoes during the clean-up drive. Despite the torrential rains, these young GenFest participants continue to collect trash along the coasts of LPPCHEA.